The R2.8 (or ISF2.8) engine is a four-cylinder turbocharged diesel engine, the smallest and lightest engine of the ISF engine family. 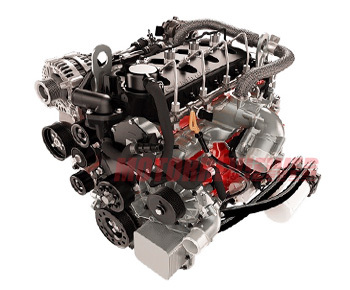 The Cummins ISF2.8 is a modern engine that combines two main qualities - power and compactness. It is an optimum choice of a power unit for light commercial vehicle applications such as pickups, trucks, vans, utility vehicles. The Cummins R2.8 engine has a cast iron cylinder block with liners that can be replaced. This gave high strength with less material use. Using a simple and cheap alloy provides low cost, reliability, and repair possibility. The ISF2.8 has a cast iron cylinder head also. There are four valves per cylinder, a chain-driven single overhead camshaft, and fuel injection nozzles in the middle of each cylinder. The camshaft actuates valves by rocker arms (short ones are for intake valves and long - for exhaust valves). All valves are made of heat-resistant steel and have chrome plated stem. The intake and exhaust valves look the same but they are not interchangeable. The timing chain and tensioner are located on the flywheel side. The chain does not require maintenance for the entire life of the engine. The engine has the high-end technology fuel system - electronically controlled Common Rail fuel injection. The high-pressure fuel pump is mounted on the front end of the engine. It is driven by camshaft through the gear. The ISF2.8 has turbocharger HE 200 WG without an intercooler. The engine is equipped with start-up relief devices at low temperatures. An electric spiral provides heat air for the intake manifold. 1.0 - one mark on the engine oil dipstick. Foton Tunland pickup, GAZelle NEXT, commercial vehicles. The ISF2.8 is built and assembled in China. Cummins says what the ISF2.8 engine has 300,000 miles (500,000 km) longevity. But in reality, this engine has a terrible reputation on the Asian market because of low-quality assembling and materials. The most common failure of this engine is a quick wearing of cylinder walls. As a result, increased oil consumption. The next problem is bad connecting rod bearings damaging a crankshaft. Besides that, the engine easily overheats. There is a high risk of coolant penetration inside cylinders. The list goes on and on. The ISF 2.8 engine meets Euro 3, Euro 4 emission standards, depending on modifications. The R2.8 is built in the Cummins factory in Columbus, Indiana (500 engines in 2017) and carries a 90-day warranty only. They use engine blocks machined at Cummins’s Chinese plant. The crate R2.8 engine meets EPA’s Tier 0 (LDT 1 and 2) and Tier 1 emissions standards. In this case, it is suitable only for vehicles produced until 1999.